I discovered it a while ago when I found the original image on flickr. It's got everything. It refers to a touching photo, a moment of our history that illustrates the warmth and humanity of our new leader. It's ironic to see a man named Barack Hussein Obama cartoonishly transformed into a white icon of the american west. 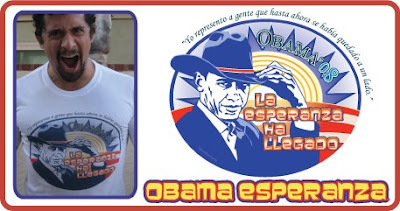 The message in spanish is great: "The hope has come; I represent those who have until now been left by the wayside." The whole thing is ridiculously campy as well, sort of a garbled, psudo-patriotic shirt that I would normally be appalled to wear, but representing everything I love about america: Bravado, excitment, multi-cultural struggle, honesty, and... hope. This is even better than I expected from the explanation you gave, which was pretty glowing in the first place. Don't be surprised if you see me killing one of these next summer as well. Also don't be surprised if i never use that expression again. Quasi-hipness suits me almost as well as tank tops do. "Davey was rockin' that Obama T when he killed on his Senior Seminar presentation!" Speaking of which, I really need to do a bit on Urban Dictionary. A survey of the last week includes "sexting" "Salsa F*cked" and "screwvenir." Awesome. Finals Week, and Cultural Pinnacles.